hello! The weather cooperated today so I could photograph my card! 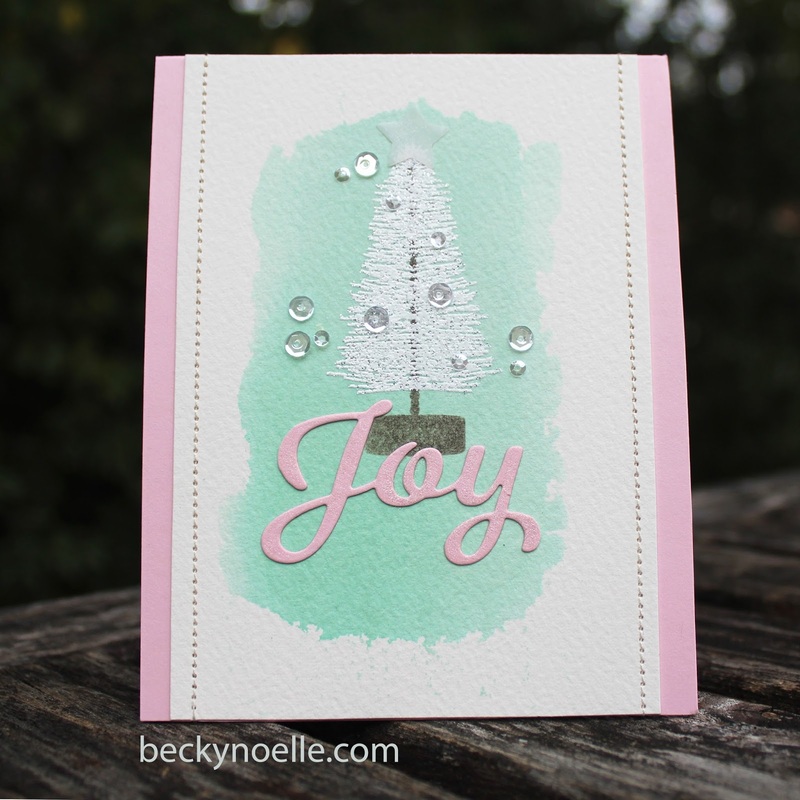 This is one of those cards that managed to come out perfectly how I had envisioned it! I started with a 4 1/4" x 5 1/2" piece of watercolor paper. I used an ink smooshing technique for the background. I rubbed my Aqua Mist ink pad directly on a big acrylic block and spritzed it with water. I picked up the ink with a sheet of clear acetate and then smooshed it around on my paper to create the background. 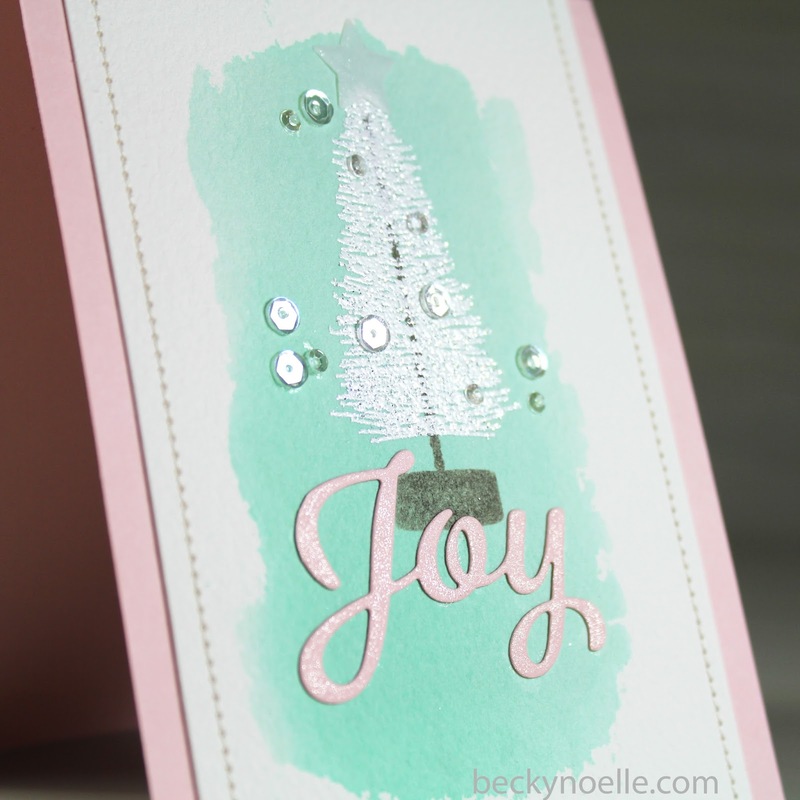 dried my background with my heat tool and then stamped the tree base and the tree and embossed the tree in a pretty white sparkly embossing powder. I cut the watercolor paper down a bit, about 1/4" on each side, and mounted it on a pink card base. I used my sewing machine to stitch the lines down each side of the card. I die cut the word Joy from the pink cardstock (the die I used is actually the Enclosed" Bell die, I just cut the word out of the bell) and adhered it to the card. I die cut the star out of vellum and adhered that to the top of the tree. I ran over the Joy and star die cuts with a wink of stella pen and then finished off the card with some pretty Moonshine sequins.